The Whiteleaf Centre opened its doors to patients in February 2014. 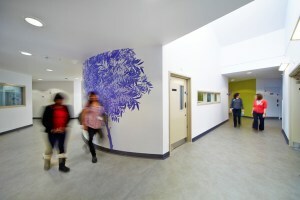 It is a purpose-built facility for the treatment of people with mental health problems. With its neighbouring Trust facilities the Sue Nichols Centre and Woodlands, it forms the Buckinghamshire Health and Wellbeing Campus. The Whiteleaf brings together patient care for adults and older adults. There are four wards, a day hospital, many consulting rooms for outpatients and individual and group therapy sessions, a resource centre and facilities for staff and visitors. The Whiteleaf has been built to a high specification for patient safety and dignity. It is a pleasant environment, with artwork incorporated into the design throughout. If you are concerned about your health or the health of someone you care for, you should first consult your GP. If you believe that your needs are urgent, please call 111 for further advice. For further information about accessing health services, please check here. If you are already registered with our services, and do not know how to contact the team co-ordinating your care, please call the Whiteleaf Reception on 01865 902000, or the Trust main switchboard 01865 901000.